Since November 1st I am doing research on the mechanisms of polymerase exchange under DNA damage conditions in the laboratory of Dr. Joseph Loparo at Harvard Medical School in Boston, USA. In case you do not belong to the small group of people who intuitively know what my projects entails, this page intends to make it more clear. Below you see a photograph taken out of my window at night. It symbolically stands for the need to regulate complex processes which are required to achieve a certain task. As with traffic a constant “flow” is also important for DNA replication. Every cell contains the same DNA so replication events are constantly occurring during life. 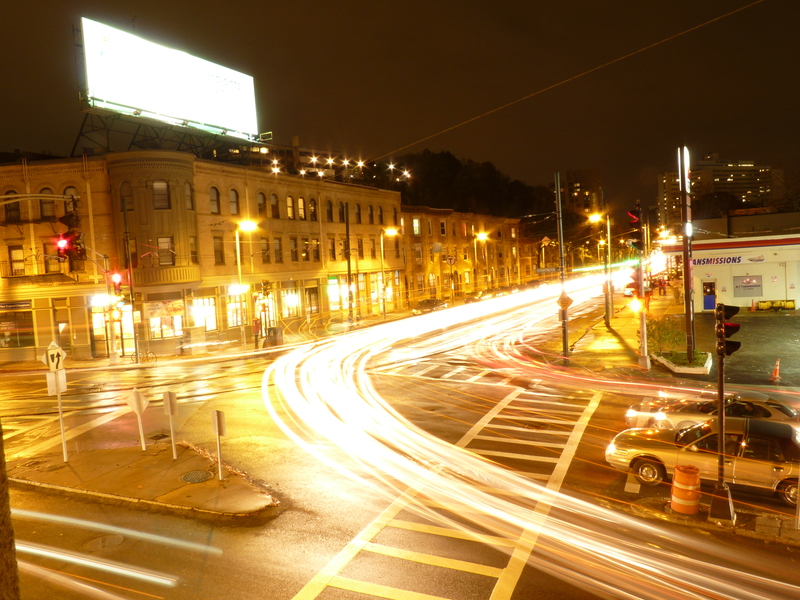 However, there are certain “stop-lights” involved which come into play under certain conditions. During rush-hour traffic lights are controlled in a different manner then at 3 o’clock at night (at least this is desired). In a living cell it’s almost always rush-hour. Still, many checks lead to a surprisingly perfect flow with very few mistakes occurring. Despite this, external “stress factors” can distort the flow. Imagine the driver on the right would not care about his or her red sign. The following accident would require the set-up of a detour around the site of the accident so that a minimum of traffic flow can be guaranteed. However, this detour will make the overall traffic situation less efficient (especially during rush-hour!!) and everything will take way more time than needed. But at least a total breakdown can be prevented. The sun’s UV-light leads to sort like accidents during DNA replication flow, because it changes the regular DNA structure which causes the formation of a so-called “roadblocks”. Regular enzymes called Polymerase III that catalyze the DNA replication can not replicate across these roadblocks. Polymerase III normally guarantees a high fidelity DNA replication meaning that there is an extremely low copy error rate. A problem related to this high accuracy is that Polymerase III is not very tolerant to DNA damage. So in order to prevent a total DNA replication breakdown a “detour” enzyme comes in (for example Polymerase II or IV). These enzymes are build up differently and are more tolerant to DNA roadblocks. However, they slow down the whole replication process and can lead to even more errors when used for too long. This is why the use of Polymerases II and IV needs to be tightly regulated. Despite the importance of this process currently not a lot is known about it. And this is what my work will focus on. The following explanations might become a bit more technical, but I will try to keep it to a minimum. To recap you knowledge about the general DNA replication process I want to introduce Fig.1. It depicts the protein complex that is required and sufficient for DNA replication in Escherichia coli bacteria. Together these proteins constitute the replisome. Fig. 1: Schematic overview of the replisome. DNA helicase unwinds the double stranded DNA. Two single DNA strands arise; one in 5’-3’ and the other one in 3’-5’ direction. 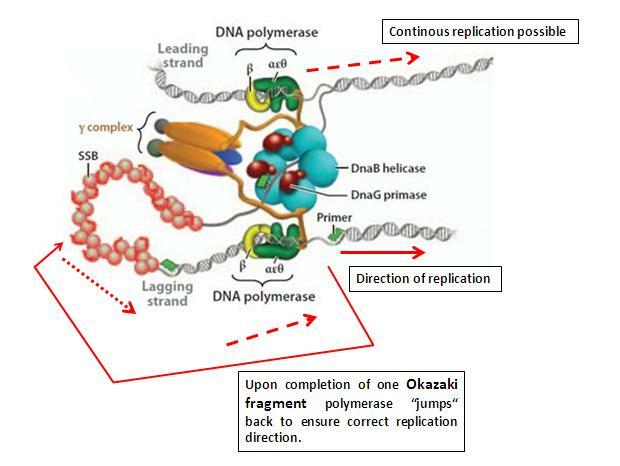 Because the DNA polymerase complex is only able to synthesize into the 5’-3’ direction in a continuous fashion, the inverse direction needs to be synthesized in small bits called Okazaki fragments. The strands are therefore termed “leading” and “lagging” strand, respectively. Primase attaches primers to the DNA so that replication can be repeatedly initialized on the lagging strand. In E. coli the two DNA polymerases are tethered to the helicase by the γ clamp-loader complex which is especially required to load the β clamps through which the αεθ DNA polymerase subunit attaches to the single DNA strand. Single strand binding proteins (SSBs) ensure that the single strand does not coil up and remains accessible for the lagging strand polymerase (based on: van Oijen, Loparo, Annual Reviews Biochemistry, 2010). Back to the switching between the polymerases under DNA damage conditions: This process is termed translesion synthesis response (TLS) because the DNA roadblock (lesion) is bridged. A few aspects of TLS are already known, but in order to understand what they entail it is important that you have good grasp of Fig. 1. It has been elucidated by O’Donnell and coworkers (Molecular Cell, 2005) and Sutton and colleagues (PNAS, 2009) that the β clamps which tethers the αεθ polymerase III subunits to the DNA plays an essential role during TLS. Fig. 2 explains why this is the case. Fig. 2: Structure of the DNA β clamp with its rim and cleft contacts sites for Polymerase IV. Within the structure of the β clamp two hydrophobic clefts have been identified. These seem to be able to accommodate certain amino acid residues of the so-called “little finger” domain of Polymerase IV. 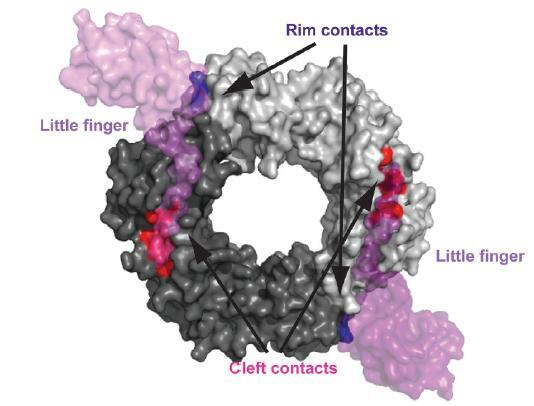 This essential key-lock mechanism is supported by additional rim contacts (Loparo, based on Bunting et al., EMBO, 2003). Therefore the β clamp seems to serve as the basis for polymerase exchange during TLS. The next question would be: How can we study the dynamical changes between Polymerase III and the other polymerases such as Polymerase II or IV? In Dr. Loparos’s laboratory several different methods have been developed how these changes can be observed on a single-molecule basis. The focus of my project will especially lie on the TLS polymerase II (Pol II) and how it is able to replace the replicative polymerase III (Pol III). Pol II is special in regard to its high-fidelity and proofreading capability by its 3’-5’ exonuclease. These features are not present in the other existing translesion polymerase and make Pol II an interesting object to study. Also there are indications existing that the Pol III – Pol II exchange might work differently than the Pol III – Pol IV exchange. Single-molecule biology only works when methodology originating from physics is combined with biologically relevant questions, and classical biochemical techniques. Traditional biochemical studies have obtained almost all of the current DNA replication knowledge and are continuing to do so. However, bulk effects seem to average out the dynamic states which are so essential for protein functioning. Single-molecule and fluorescence methods are a powerful means to study the functional trajectories of proteins while they are functioning. Studying the formation of (replisome) complexes is a very interesting application and has been demonstrated to be successful. The development of procedures to very locally and quantitatively study the mechanisms and stoichiometry of polymerase exchange will be central to this project. Fluorescence (TIRF) and Förster Resonance Energy Transfer (FRET) microscopy can then be applied to image and quantify the associations of the labelled single molecules. Central to these approaches is a single-molecule primer extension assay. It works by the application of a microfluidic flow-cell in which a DNA molecule is attached to a glass surface and is consequently stretched by a laminar buffer flow (Fig. 3, top). Extending this linear molecular and observing the change via fluorescence microscopic techniques allows to make conclusions about polymerase behaviour and dynamics (Fig. 3, bottom). Fig. 3: The principle of a laminar flow cell which can be used to determine the single-molecule dynamics of polymerases (top) and an example of the fluorescence patterns that can consequently be observed by dark field microscopy (bottom). See the text for more details (based on: Tanner & van Oijen, Methods in Enzymology, 2010). Based on these data (DNA length extension and time) it now becomes possible to actually observe polymerase switching. Previous studies have shown that Pol III is much faster in synthesizing long DNA molecules than other polymerases. By determining the difference between polymerase extension speeds it therefore becomes possible to determine which polymerase is active. Furthermore, it has been determined that a single Pol III synthesizes about 900 base pairs before it leaves the replication fork and a new Pol III comes in. Between these events always a small pause occurs. The lengths of the pause depends on the polymerase concentration. This is logical because at a higher polymerase concentration a switch can occur faster because there simply more molecules available in a certain location. By measuring a number of single-molecule trajectories under different conditions and with different polymerase types it becomes feasible characterize polymerase dynamics. Fig. 4 shows the result of a plot where two different polymerases were tested. 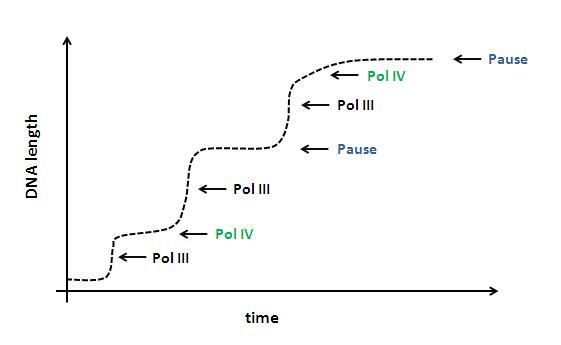 Because the pause length and the reaction speed are known it is possible to distinguish between Pol III (fast) and Pol IV (slow). Fig. 4: Time and DNA length info from a flow-stretching assay helps to identify switching dynamics of polymerases if synthesis speed pausing behaviour is known (see also Fig. 3). Most of the above described approaches and the derived knowledge is only valid for Pol III/Pol IV switching. The situation might be different for Pol III/Pol II switching. Elucidating Pol II switching behaviour with the above describes assay will be a main aspect of my project. While playing around with the open-source GNU Image Manipulation Program (GIMP) I asked myself: Why not transform proteins into a construct that does not resemble the standard Protein Data Base structures? Well and this is the humble result: Another perspective on the famous green fluorescent protein, which has become so important for many projects. The GFP molecule you are seeing above is actually a modified version of the “real” protein. By modifying certain amino acids researchers around Jenny J. Yang (Georgia State University, Department of Chemistry) managed to lend calcium and proteinase detecting properties to GFP. GFPs can then be incorporated into tissues were it is important to monitor calcium concentrations. In many organisms calcium is used to build up gradients to for example transmit chemical “information” as in nerve cells. Therefore, this type of protein, next to its funny looking barrel shape, also offers some handy features to work with and might help to detect diseases such as cardiomyopathy Alzheimer’s on a molecular scale (= earlier). With the fitting amino acid mutations GFP can not only be used for the detection of calcium ions, but also for the detection of other ions. A very famous ion is the hydrogen ion. The concentration of hydrogens ions determines the pH (yes, that’s the H in pH). The following few lines might be a bit technical, but they explain why GFP is loved by so many scientists. And why it is a perfect example of a biomolecular structure-function relationship. High pH sensitivity and specificity, rapid signal response and good optical properties are important characteristics for a pH sensor. In addition it must be possible to reach intracellular sites in a non-invasive and non toxic manner. GFP fulfills many of these prerequisites and therefore has been used as intracellular pH sensor. But how does it work? The sensitivity and specificity of GFP mainly seems to be based on the protonation state of the phenolic group of the chromophore (the green thing in the center). In other words the charge of the light emitting parts of the GFP molecule changes. The GFP chromophore 4-(p-hydroxybenzylidene)imidazolidin-5-one (HBI) lies in the center of GFP’s β-barrel structure (made up of the white arrows) and normaly is non-fluorescent due to its unionized phenol group. However, the inward facing amino acid residues Ser65–Tyr66–Gly67 can cause the ionisation of the phenol group, leading to potential fluorescence. During different pHs, different protonation states of the chromophores phenol group are likely to influence its photochemical properties by influencing the ionisation of the phenol group. Different pH values therefore change the charges of the centrally located molecule that is responsible for the green light. A different pH value translates into a different light intensity. Check Ulrich Haupt’s and coworkers article if you want to know more. Tryptophan, what have you been doing? The University of Groningen where I currently study has formulated three key research areas that are meant as a strategic aim in order to distinguish itself from other universities. One of these research areas is called “Healthy Ageing”. This week the scientific journal PNAS will publish an interesting article on work by Dr. Ellen Nollen and coworkers in which they describe how the depletion of a certain gene leads to higher tryptophan levels and seems to protect C. elegans worms from protein aggregate-related disease. Since protein aggregates are hold responsible for Alzheimer and Parkinson disease in humans and not a lot is known about the related protein metabolism, this paper indicates some new potential therapeutic targets and fits perfectly into the university’s aim to promote research on “Healthy Ageing”. As this paper indicates that high levels of thryptophan might have a protective effect against protein aggregate-related diseases I considered it interesting to look into it a little bit deeper. The gene that is central within this research is called tryptophan 2,3-dioxygenase (tdo-2) and encodes the enzyme TDO-2 which is responsible for the digestion of the essential amino acid tryptophan. 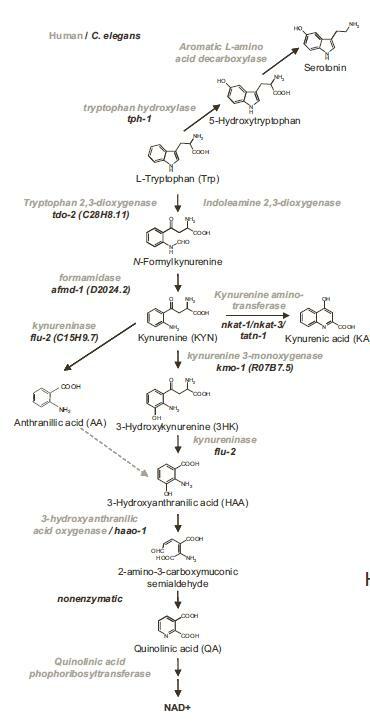 During their studies the researchers from the Netherlands, Germany, and France found that genetic suppression of tdo-2 (also called knockdown) leads to inhibition of the tryptophan metabolism and thereby to higher levels of this amino acid in the tissues of the worms which were the labrats-substitutes here. Deciphering a metabolic pathway is very nice, but what makes van der Groot’s et al. results even more interesting is the fact that a longer lifespan of the worms was observed upon tdo-2 knockdown. It also proved to be effective to supply excess amounts of tryptophan and leave the tdo-2 gene “switched on”. Since in general C. elegans is regarded as a good model organisms for age-related diseases such as Parkinson or Alzheimer, in the following let us have a closer look at the study and its results. The worms which were part of this study actually suffered from the expression of alpha-synnuclein known for its protein aggregation promoting behaviour. High levels of this compounds actually lead to less motility of the worms and expressed in the unit body bends/minute. Suppressing tdo-2 with RNAi considerably extended the time period within the worms lives with a high motility rate. According to the researchers this indicates suppressed effects of alpha-synuclein. As metabolic networks are important in biology the next question asked as whether an up- or downstream (concerning the location of tdo-2) element was responsible for the observed effects. All the genes mentioned in Fig. 1 were knocked down in combination with or without tdo-2 expression and it was observed that knock-downs of downstream genes had no or only a very small effect on worm motility. Therefore the levels of tryptophan seemed to be the key to the observed effects. Fig. 1: TDO-2 related metabolic pathway. However and as depicted in the above figure tryptophan is also a part of the neurotransmitter serotonin synthesizing pathway. Serotonin levels are currently a prime element in the understanding of Alzheimer disease and are also used in therapeutic approaches. A significant element of Nollen’s and her colleagues’ work is, however, that they prove that serotonin has nothing to do with the observed motility and lifespan effects. Knocking down the tph-1 gene in combination with tdo-2 does not significantly change the worms abilities to move. Summing up, all conducted knock-downs during this study therefore lead to the conclusion that the TDO-2 enzyme and (when it is suppressed) higher tryptophan levels are responsible for the increased mobility and decreased alpha-synuclein toxicity. This point was further stressed by the addition of tryptophan to the diet of worms which did express TDO-2 (Fig. 2). 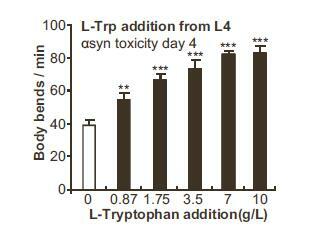 In a dose dependent manner tryptophan compensates for alpha-synuclein toxicity. Fig. 2: Raised tryptophan levels suppress alpha-nuclein toxicity also in the absence of a tdo-2 knockdown. Now it starts to become interesting: What does tryptophan do? How does it prevent protein aggregation on a molecular basis? Does it regulate some yet unknown biochemical pathways? Sadly enough the authors stay very brief on these points, either because they do not know more themselves yet or because another publication in Nature or Science is waiting in the future. What they say is that they do not expect tryptophan to be directly responsible for the observed effects, but this amino acid (or its derivates) probably plays a role on other biochemical pathways or their signalling molecules. Nevertheless this work proves that a lot of knowledge about protein aggregate-related diseases still remains in the dark. It also opens up possibilities to study the observed effects in mammals since the tdo-2 gene and its enzyme product is evolutionarily extremely well conserved. TDO-2 is one of the proteins that links us with C. elegans worms. To what extend the tryptophan metabolism plays a role in human age-related diseases such as Alzheimer and Parkinson is a question that many research groups will work on in the future. van der Groot AT et al., Delaying aging and aging-associated decline in protein homeostasis by inhibition of tryptophan degradation. Proceedings of the National Academy of Sciences of the United States of America, published online before print on August 27th 2012, accessed on August 29th 2012. Some things in biology can be observed best when concentrating on one molecule and its functions. System biologists will probably not agree and intervene that in biology it’s all about networks and interactions. The presence and concentration of A influences B which increases the concentration of C which consequently down regulates A again. This is all true. However, in single-molecule biology it’s about the functioning and dynamics of (you guessed it) single molecules. When looking at larger systems there is always the danger of missing out elements that might occur only under certain conditions, low concentrations, or that are masked by certain other secondary processes. The weak point of single-molecule studies has always been the fact that complex systems are drastically reduced. Again, you miss-out a lot of stuff even though now you are able to study one molecule in detail. But: Change will come. As I described in an earlier post super resolution microscopy has been around now for a few years and it is a ready-to-use technique now. For just $ 1,000,000 you can get your own. Theoretically many fascinating research results should have been published until now. Observe single molecule dynamics in their native environment, what more could you wish for? Indeed some spectacular footage has been produced. Stefan Hell and coworkers, for example, were able to record neurons within the cerebral cortex of a living mouse with a resolution of around 70 nm. Until 20 years ago physics books would have told you that this is impossible. So have a look yourself, right here. Strangely enough this research at the same time also demonstrates and interesting phenomenon that can be observed when scanning through the live-cell super-resolution microscopy: Most of the time only structurally large (>200 nm) and functionally already known molecules (like neurons) are observed. Further, the temporal resolution is not great and in the order of seconds. Fast moving molecules are still hard to image due to hardware (CCD camera, scanning) limitations. Of course it is very interesting to see how dendrites in the brain expand during learning, but it does not raise any new questions and most importantly does not answer any old ones. I am sure that super-resolution microscopy has a golden future, but it is important to improve sample preparation techniques, optimize fluorophores even further, and develop sensors that have a shorter integration time for the small amount of photons they are capturing per frame. Classically the resolution of light microscopy has been limited by the diffraction of light. Resolution of sub 200 nm structures were thought to be impossible. Things have changed with the invention of stimulated emission depletion (STED) microscopy and other superresolution techniques. STED might be especially interesting for cell biology research in the future because cellular structures can be resolved on a molecular level. In the following I will shortly explain how STED works and I will also present a recent paper in which STED has been used to elucidate the molecular features of the centriole, a protein that is important for cell division. The basis of STED microscopy is the on-off switching of fluorescent molecules within a probe such as a cellular structure. By turning on single or at least only a few fluorescent particles at the same time, imaging them, turning them off again and then moving to the next spot (scanning the sample) drastically increases the available resolution. As only single point-like objects are detected at one point of time at one specific location, summing up all these points in a picture allows for drastic improvements when compared to classic confocal microscopy (Fig. 1). In classic confocal microscopy all fluorescent molecules within the excited spot are detected which means that some spots are overlapping each other and thereby reduce the resolution. Fig. 1: STED versus classic fluorescence confocal microscopy (Source: Willig et al., New J. Phys., 2006). An essential question, however, remains: How to rapidly switch fluorophores on and off? This phenomenon is achieved by making use of stimulated emission. As described in the previous post, electrons can rise to an excited state upon absorption of photon. When they fall back fluorescence photons are emitted again. However, this process takes some time. Shining red-shifted at the previously excited spot can stimulate a faster photon emission of a different wavelengths. From now on this second beam will be called STED beam. This “forced emission” is the basic principle of STED microscopy. When the STED beam is modified to become doughnut shaped via a polarizer then only the small inner circle of the previously excited molecules will light up. All surrounding molecules will emit earlier and are therefore unavailable for imaging (Fig. 2). 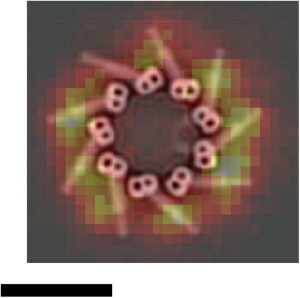 As described above, the size of the inner circle of the STED beam determines the resolution because it selectively allows the detection of single molecules which can be pictured by scanning whole sample and summing up all individual molecules. The diffraction barrier which has been formulated by Ernst Abbe is therefore not only shifted, but broken because theoretically the inner doughnut circle can reach extremely small diameters allowing very detailed images. Fig. 2: Left: Diffraction limited excitation spot. Middle: Doughnut-shaped STED beam which is applied to the excitation spot and leads to stimulated emission of photons. Right: Stimulated emission of unwanted photons results in a small center containing molecules which emit at the desired wavelength. This spot is not diffraction limited anymore (Source: Marcel Lauterbach). Now, with the above described features in mind, I shortly want to demonstrate how STED microscopy can be used in a biology related context. In a recent article Moerner and coworkers from the Department of Chemistry at Stanford University show that the 250 nm sized centriole complex, responsible for the coordination of cell division, is surrounded by nine clusters of the Cep164 protein (Lau et al., 2012). Observations of features of protein complexes were long thought to be impossible with relatively non-invasive light microscopic techniques. However, STED can do the job. Fig. 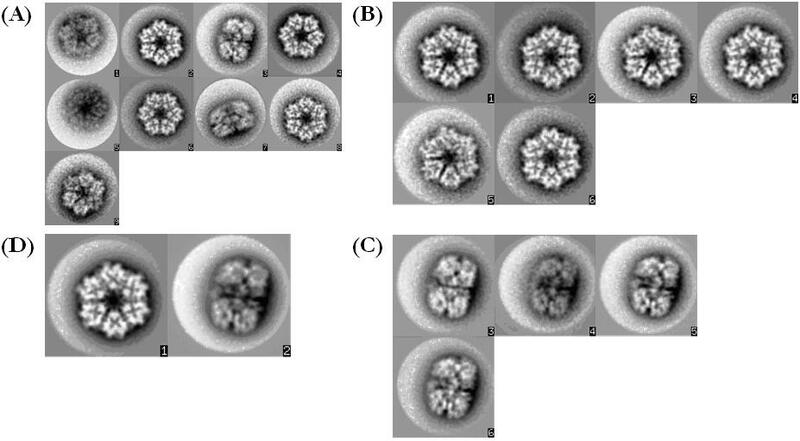 3 shows how the nine-fold complexes around the centriole actually look like. In addition the obtained results are compared to standard confocal microscope results which of course does not make use of a STED beam. 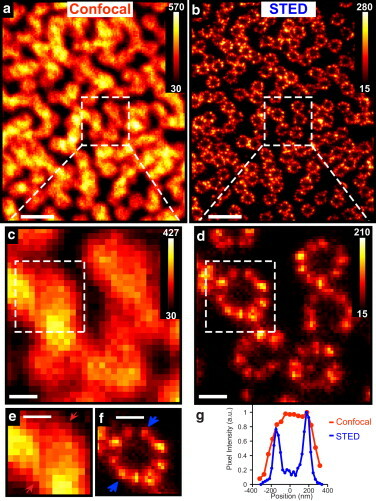 The picture in the bottom right corner also clearly illustrates the advantage of STED microscopy over confocal microscopy in a graph: When displaying the fluorescence intensity as a function of spatial location in nanometers, the observed intensity peak for confocal microscopy is much broader, but not higher. In STED microscopy two distinct peaks become visible which allow the resolution of two individual objects. The maximum achieved resolution in this study were 60 nm which delivers about four times sharper pictures than could be achieved before Stefan Hell demonstrated the STED principle for microscopy in the 1990s. Fig. 3: Confocal and STED microscopy of the Cep164 proteins which surround the centriole. 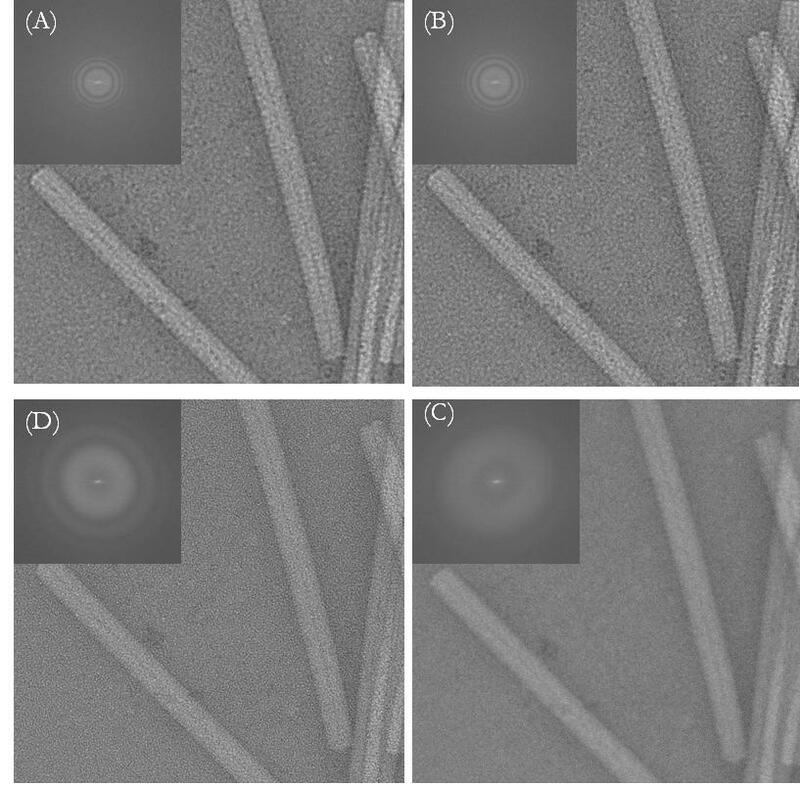 The researchers also note that the observed features are comparable to previously observed structures obtained by transmission electron microscopy (I explained some of its principles in an earlier post). However, electron microscopy exerts high electron forces on the samples which might distort protein conformations. In addition electron microscope pictures are assembled based on “ideal” reference pictures which inevitably leads to a modeling bias. Fig. 4 shows that it is indeed possible to compare light microscopic images to electron microscopic ones. They significantly overlap with each other and underline the strengths of both imaging techniques and especially the combination of the two. Fig. 4: Overlap of a transmission electron microscope with a STED microscope obtained picture. The locations of the nine Cep164 complexes match each other. The scale bar has a size of 200 nm. Here, the researches made use of fluorescent antibodies and it should be noted that antibody artifacts always distort images. Also the on-off switching right of the used fluorescence molecules determines the capabilities of this technique, next to the brightness. Still, it is very likely that in the future many practical aspects of STED microscopy will be improved which will lead to a number of interesting insights into molecular cell biology. If you are interested actual proposed functions of the Cep164 complexes, you can find more information in the first listed article. The second article describes the above mentioned research. Graser, S., Stierhof, Y.-D., Lavoie, S.B., Gassner, O.S., Lamla, S., Le Clech, M., and Nigg, E.A. (2007). Cep164, a novel centriole appendage protein required for primary cilium formation. J. Cell Biol. 179, 321–330. Lau, L., Lee, Y.L., Sahl, S.J., Stearns, T., and Moerner, W.E. (2012). STED Microscopy with Optimized Labeling Density Reveals 9-Fold Arrangement of a Centriole Protein. Biophysical Journal 102, 2926–2935. In previous posts I tried to explain why light is so important for biology and how its properties can be used in biology research. The process of absorption is especially important for understanding the role of light within the field of biology, which is obvious since light can only have an effect if it interacts with matter. Molecules can absorb light because their electrons become more “energetic” and rise form the so-called ground state to one of the excited states. These different states and their significance for biology will be explained in the following. Molecules that are able to absorb light of the biologically interesting spectrum with wavelengths form approximately 100 to 800 nm are also called chromophores. Such molecules often contain a delocalized π-electron system which means that these molecules can form bonds that occur between electron orbitals (outer electron cloud around the atomic nucleus) called π-orbitals. Many of such π-bonds result in an electron system within the molecule which is flexible once it absorbs the energy of photons which make up light. The electrons within such a flexible system can then become delocalized or spread out across the molecule. Therefore, molecules which contain a delocalized π-electron system are especially sensitive to the absorption of light. In practice a π-electron system can be found in molecules containing aromatic systems and/or a relatively high number of conjugated double bonds. Figure 1 displays how pH changes influence the protonation states of an anthocyanine molecule, a plant colorant which gives flowers and berries their distinct colors in many plants. Of course, one finally only observes the non-absorbed photons. The anthocyanine molecule is a good example for the interesting color properties of molecules that can change once the atomic make-up changes. This molecule is also a good example for a π-electron system (see the aromatic rings). An electron excitation can, however, only occur if photon energy matches the energy difference between the ground and the excited state. When the electrons of single atoms fall from the excited state back to the ground state they emit the previously absorbed energy again in the form of a photon which matches the wavelength of the previously absorbed photon. Therefore, absorption and emission spectra of single atoms are identical. However, things are different for molecules which of course by definition always contain at least two atoms. Bound atoms can vibrationally interact with each other which costs energy. In a molecule every electron state can be subdivided vibrational states and each vibrational state can again be split into different rotational states. Still, the photon’s energy must match the energy difference between the ground and excited state in order to become absorbed. This results in the fact that molecules can absorb a range of wavelengths and due to vibrations emit longer wavelengths containing less energetic photons. While single atoms can only absorb and emit single spectral lines (Figure 2) molecules can absorb and emit broader band light spectra. Hopefully, the basics of absorption are now a bit clearer. However, we have not discussed yet how an excited electron can lose its energy again. Depending on the excited state it is in the electrons can choose different paths to fall back into the ground state. As described, during these paths the electrons emit longer wavelengths photons which are responsible for biologically interesting processes such as fluorescence, bioluminescence, or phosphorescence. But also other processes occur that are not directly visible by eye when the electrons fall back to the ground state. These include internal conversion, intersystem crossing, resonance energy transfer, and photochemical reactions. In the following, all of these effects will be described. A so-called Jablonski diagram (Figure 3) schematically displays the different electron states and their subdivision into vibrational and rotational states. 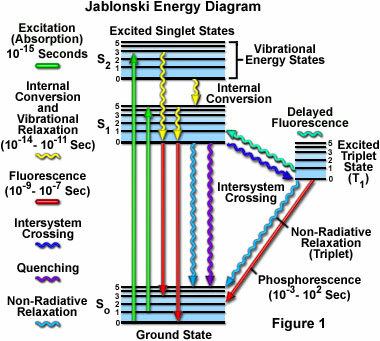 A Jablonski diagram also helps to “visibly understand” what happens to excited and returning electrons. So let’s start. First of all electrons become excited by photon absorptions which rises their energy level to the first or second singlet state depending on the available energy and molecular properties. This process is extremely fast is depicted by the green arrows. Internal conversion (IC) always occurs in molecules when excited electrons fall back to the ground state. During IC the absorbed energy is converted into kinetic energy in the form of vibrations or rotations. No electromagnetic radiation occurs. Yellow curly arrows indicate this process which logically occurs between the vibrational states, but also within one vibrational state containing more rotational states (not shown). 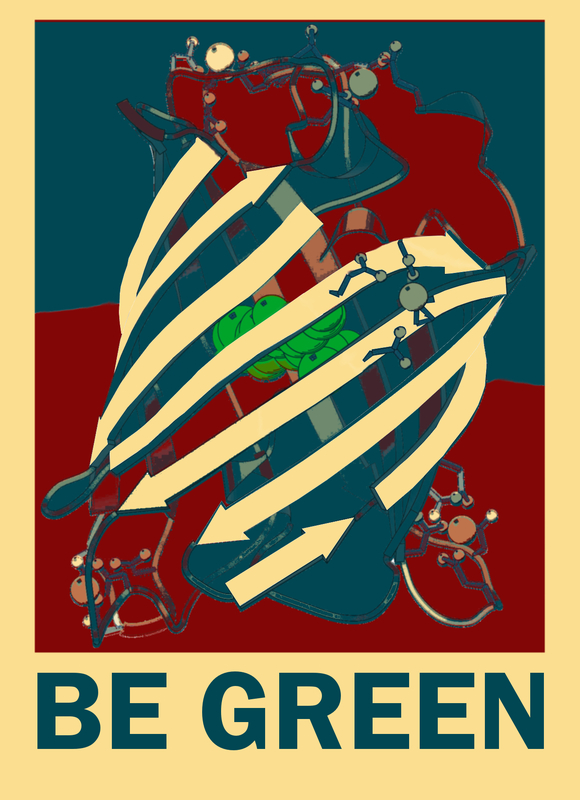 An observable process is fluorescence. When an electron falls back from the first singlet state into the ground state it emits electromagnetic radiation in the form of a photon. However the emission wavelength is longer because the electron has lost energy due to IC on its way from the second singlet state to the first singlet state or due to IC within just the first singlet state. Fluorescence is indicated by the red down facing arrows from S1 to S0. Bioluminescence is the process of fluorescence within biomolecules such as green fluorescent protein (GFP). Another important feature of electron states is the process of intersystem crossing. During intersystem crossing an electron moves from the excited first singlet state into the first triplet state. A triplet state is a state in which an electron can only be found once its quantum mechanical spin reverses from -1/2 to +1/2. Quantum mechanically this very unlikely and therefore a triplet state occurs less often than the other two excited states. Intersystem crossing is indicated by the blue curly line. The process of phosphorescence occurs one an electron has managed to enter the triplet state by intersystem crossing and falls back into the ground state. As in fluorescence a photon is emitted, but it contains less energy and it time delayed with a factor of about one million because a triplet state is not stable state. 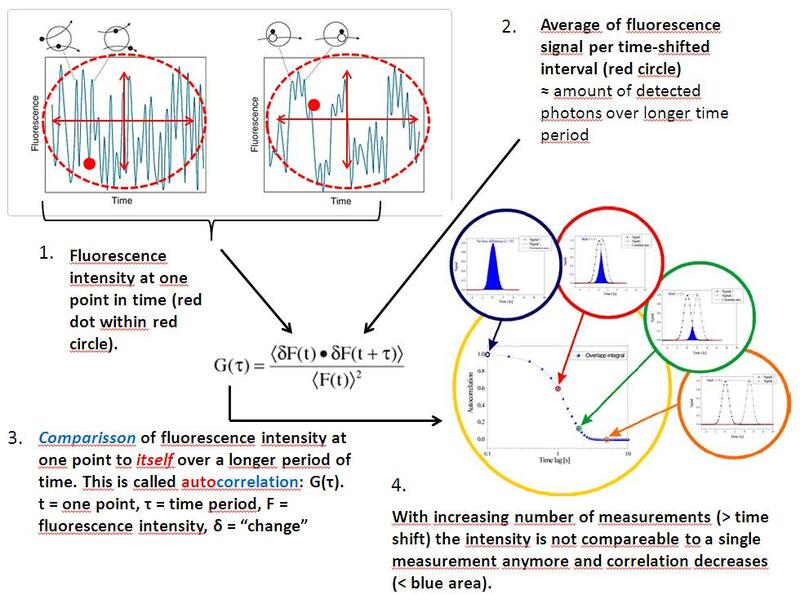 In research applications (such as the earlier described fluorescence correlation spectroscopy) where only the emitted fluorescence at a specific point in time is required, a certain percentage of phosphorescence signal therefore needs to be subtracted from the total signal. Phosphorescence is indicated by the red arrow facing to the lower left corner. Zooming out and looking not only at one molecule, but for example two neighboring molecules, makes it possible to observe two other interesting electron effects. The first one is called resonance energy transfer. If the fluorescence spectrum of a donor molecule and the absorption spectrum of a acceptor molecule match the vibrations of the former molecule’s electron can excite the latter molecule’s electron. Then a longer wavelength fluorescent emission of the second molecule can be observed even though it has not been excited directly with photons. This process is the basis of Förster Resonance Energy Transfer (FRET) which can be used to determine whether two molecules are in close proximity. If two proteins are close two each other, the chromophore electrons of the first one therefore might vibrationally excite the electrons of the second one and fluorescence of a distinct wavelength can be observed. A second interesting photo effect between two neighboring molecules is a so-called photochemical reaction. Here, a very strong excitation removes an electron from its original orbital and the molecule therefore becomes oxidized. Another molecule which receives the electron is reduced. Oxidized and reduced molecules can then participate in “regular” chemical reactions. Photochemical reactions are the basis of photosynthesis where chlorophyll electrons power the electron transport chain in plants. I hope that this short summary of light and biology serves its purpose of demonstrating that understanding a little bit of physics and a little bit of biology and joining both, can lead to some very interesting insights! For people who are interested more in photons and their effects on electrons I want to recommend an extremely appealing Java-animated tutorial created by Olympus. Fluorescence Correlation Spectroscopy (FCS) in combination with a Laser-scanning confocal microscope (LSCM) is a commonly used tool to quantitatively determine properties of molecules diffusing through a defined volume and properties of the medium itself. When assuming no labelling-bias, the observed fluorescence intensity changes can yield information to determine physical properties such as the molecular diffusion coefficient and medium viscosity, but also hydrodynamic radii, average concentrations, kinetic data, and singlet-triplet dynamics. Here I want to show how you can use an LSCM-FCS setup to determine the diffusion coefficient of a fluorescent molecule (in this case Rhodamine B), the viscosity of a mixture containing Rhodamine B, and the hydrodynamic radius of fluorescent beads in water. For all measurements a 543 nm He-Ne laser was used. All calculation are based on only two values that can be determined during FCS analysis. How (A) the molecular diffusion time and (B) the number of molecules within the observed volume are derived from observed fluctuations in fluorescence intensity has briefly been described in my blog and can be found here. With just knowing (A) and (B) many interesting things can be calculated in a short amount of time. In the following for example the “exact” size of the confocal volume is determined, as well as the “diameter” of the molecule. Why the parentheses? Well, you are deriving certain values from the observation of other values and in a relatively complicated setup like this one (labeling, detecting, microscope…) there will always some kind of bias. I am still a beginner as well, so my intention for the future is to reduce these effects to a minimum by better understanding the theory behind LSCM-FCS and getting more practical experience. But now… let’s get started! All the (A) and (B) values were actually measured and give a better impression of what they actually mean in the context of the formulas. I also kindly want to thank Victor Krasnikov from the Department of Single Molecule Biophysics for supplying the microscope, the materials, and of course also the idea behind these trials! The Rhodamine B diffusion time through a confocal volume of unknown size and the number of particles within this volume were measured under non-diluted and twice diluted conditions. The diffusion time (τ) was 3.3 x 10­­-5 s under both conditions and the number of particles (N) within the confocal volume was determined to be 6.8 and 3.35 under both conditions, respectively. The diffusion coefficient (D) for Rhodamine B in water is Dwater ≈ 300 µm2s-1. The observation volume (V), its radius (ω1), and the concentration (C) were calculated as describes below. By inserting τ and D into (1) the confocal radius ω1 = 0.199 µm could be determined. Since the structural parameter S was set to 5 the half-length of the observation volume into the z-direction ω2 = 0.995 (2). In the following the volume (V) was calculated by inserting ω1 and ω2 into (3) yielding V = 0.219 µm3. Since logically the diffusion time under both dilution conditions is the same, of course also the size of the determined confocal volume remains the same. The confocal concentration (C) for both concentrations could now be calculated by making use of the observed respective N values, and calculated V (4). The concentration of the non-diluted solution was Cnon-diluted ≈ 31 molecules x µm-3 and Cdiluted ≈ 15 molecules/µm3. Considering the 1:1 dilution a halved concentration in the confocal volume makes sense. Three different volume/volume mixtures of water containing Rhodamine B and ethylene glycol were made (1:2, 1:1, 2:1) and the diffusion coefficients were calculated based on the diffusion times. By inserting the measured diffusion times under the three respective conditions (8.6 x 10-5 s, 1.46 x 10-4 s, 2.65 x 10-4 s) into (5) the respective diffusion coefficients were determined as D1:2 = 115, D1:1 = 68, and D2:1 = 37 µm2s-1. A plot of the respective diffusion coefficients, including Dwater, against the used ethylene glycol concentration results in the graph shown in Figure 1. Figure 1: The Rhodamine B diffusion coefficients as a function of ethylene glycol concentration as determined by LSCM-FCS. 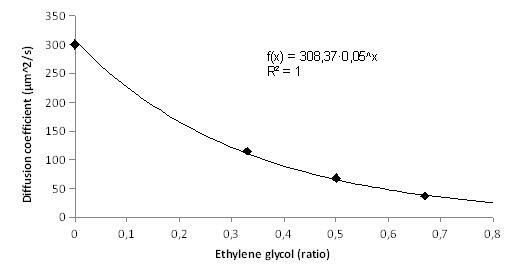 An exponentially fitted curve indicates that the measured diffusion coefficients non-linearly depend on the ethylene glycol and water ratio. This is counter-intuitive, but can probably be explained by the non-linearly behaving interactions of Rhodamine B with the increasing number of ethylene glycol molecules in the solution. The volume-volume mixture alone thus does not account for changing diffusion coefficients. For the fluorescent beads a diffusion time of τ = 1.8 x 10-5 s was observed. Inserting τ into (5) yields Dbead = 550 µm2s-1­­. Inserting Dbead and µ = 0.9 x 10-3­ Pa s-1 into (6) leads to a fluorescent bead hydrodynamic radius of r = 0.43 nm. The hydrodynamic radius indicates the hypothetical radius of the molecular shape based on the measured diffusion time. This radius is of course distinct from the actual molecular radius because many atomic properties influence the diffusion behaviour in a given solution. Summing up, I hope these small experiments and the six formulas help you to understand what you can do with your FCS data. Rhodamine B was just because it is an easy-to-handle fluorescent molecule. In principle, however, the steps described above remain the same for labeled proteins or other diffusing particles. Of course, a modern software package (Zen from Zeiss) can do it all for you. But isn’t it handy to understand what just two parameters can mean for the determination of physical properties? Transmission Electron Microscopes (TEM) are valuable tools for elucidating the structure of especially biological macromolecules. By making use of highly accelerated electrons and analysing their interactions with soft matter it is possible to significantly lower the diffraction limit as when compared to standard light microscopic techniques. This introductory course focused mainly on the theory behind TEM, operation in practice, and result analysis. Most important practical aspect which will be described below were finding suitable focus positions, obtaining high image qualities through accurate sample preparation, and practicing image analysis by particle overlaying. It is a central dogma in modern biology research that the form of biologically relevant macromolecules, such as proteins, is strongly dependent on its function. However, in order to make sense out of purely functional biochemical data it is necessary to link this data to structural biophysical information to fully grasp the structure-function relationship of a macromolecule. The observation of structures with sub-wavelengths dimensions is difficult in all microscopes, due to a diffraction limit of wave-like behaving particles like photons or electrons. This relationship was first postulated by Ernst Abbe in 1873. Form. 1 indicates how the observed spot size in an optical system depends on the wavelength λ, the diffractive index n of the medium, and the angle θ by which the particles travel through the medium. The term n sin θ is also called numerical aperture (NA) and can reach up to 1.4 in a modern microscope. Being able to distinguish two spots from each other is called resolution and is thus mainly limited by the wavelength. For a typical light microscope the resolution limit therefore lies at around 200 nm assuming λ=550 nm and NA=1.4. Structures which are interesting for modern biological research typically have dimension at or very much below this value and can therefore not be observed by standard light microscopy. However, by using electrons instead of photons the diffraction limit can be lowered dramatically because electrons can have a much smaller wavelength. Louis de Broglie in 1923 stated that the wavelength λ of any particle depends on its momentum p which consists out of the particles mass times its speed, where h is Planck’s constant (Form. 2). Since the mass of an electron is constant, its wavelength therefore only depends on the acceleration speed. In modern high-voltage transmission electron microscopes (TEM) therefore resolutions of down to 0.5 Ångströms (A) (0.05 nm) have been achieved 1. TEM microscopes are therefore a valuable tool in structural research. During this introductory course several different samples such as earthworm (Lumbricida) haemoglobin, T4 phages, and tomato mosaic virus (TMV) were examined in order to demonstrate the functionality of TEM and to gain knowledge about the operation of the microscope. An electron microscope consists out many parts which are functionally analogous to parts which are used in a light microscope. However, their construction is different and based on the electron particle properties. During the course a Philips CM12 TEM operated at 120 kV was used, which was connected to a CCD-camera. The electrons were emitted and accelerated in the top-part of the TEM from a filament (Wehnelt cylinder) by applying a high charge difference between the filament and a lower mounted anode. Electromagnetic lenses are made from iron-shielded copper coils and were used to condense, focus, and project the electron beam. A magnetic field, which is generated in the iron casing in response to the current running through the copper windings, leads to deflection and focusing of the electrons. Finally the beam is spread on the screen and can be observed through the oculars or, if the screen is lifted, through the CCD-camera system. Fig. 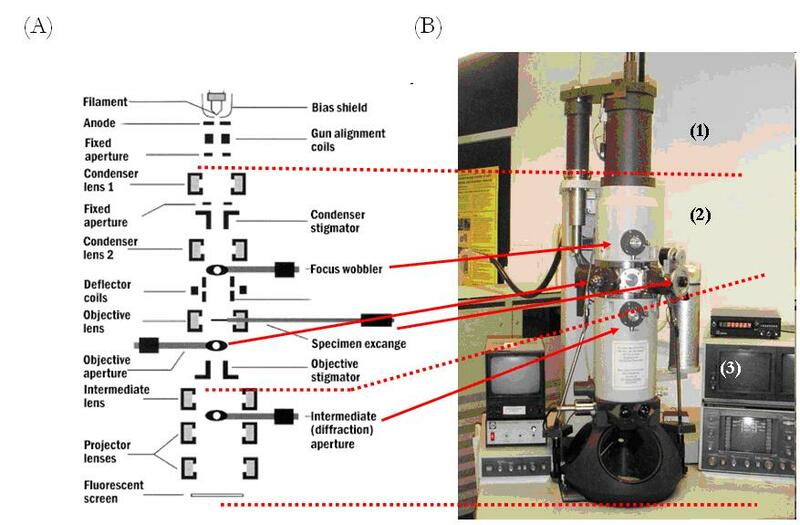 1 gives more details about the setup of a TEM, where (A) depicts a schematic overview of the most important components of the microscope and (B) is a photo of the outside of a Philips CM12 TEM. For clarity purposes the red dotted lines divide the TEM into three functional compartments (numbers on the right). Red arrows relate some of the functional features which are schematically presented in (A) to the real microscope in (B). Fig. 1: Overview of a Philips CM12 TEM. (A) Electrons are extracted and accelerated from the shielded filament by the large voltage difference towards the anode. The gun alignment coils adjust the electron source (gun) with regard to the first condenser lens. Both condenser lenses concentrate the electron beam, while (fixed) apertures define the cone angle of the electrons during their way through the microscope. The objective lens focuses the beam onto the specimen, while the projector lenses magnify the transmitted electron beam on the fluorescent screen. Stigmators are applied to correct for small magnetic aberrations within the lenses which can lead to deflected beams. In addition deflector coils are used to centre the beam on the region of interest. (B) Photograph of a TEM. Some features are marked by arrows. Dotted lines relate the schematic compartments to the real ones in order to demonstrate proportions. Own creation, based on 2 and 3. Different samples (earthworm (Lumbricida) haemoglobin, T4 phages, and tomato mosaic virus (TMV)) were obtained from the Department of Biophysical Chemsitry, Rijksuniversiteit Groningen, appropriately diluted, applied to self carbon coated and glow discharged copper 400 mesh grids, stained, and observed under the microscope. The carbon coating was obtained as follows: Rectangular mica slices were placed into a carbon evaporator which applied a thin layer of carbon to the surface. This carbon was then removed in a water bath by sliding away the mica slice from the carbon. Next, through lowering the water level, the carbon layer was applied to the copper grids which were placed on a glass slide and dried afterwards. Glow discharge was used to render the carbon layer hydrophilic in order to guarantee sufficient sample molecule adherence. Samples were diluted up to 100x in 50mM HEPES buffer and 3 µL were applied for approximately 30 seconds (haemoglobin) and 1 minute (T4 phage, TMV) on the carbon grids. Then, the grids were washed with 3 µL of buffer. Uranyl acetate was used for negative staining in one fast step for less than 5 seconds and one longer step of 30 seconds. Between sample application, washing, and staining steps excess liquid was blotted off with filter paper. The ready-to-use sample containing grids were stored in glass Petri dishes at room temperature. In order to avoid excessive damage of the sample, the low-dose system setting was used for imaging. Recorded Lumbricida haemoglobin images were processed by 2D single-particle-analysis using the programme Groningen Image Processing (GRIP). Octopus vulgaris and Sepia officinalis hemocyanine molecules containing files were supplied by the department (recorded at 45,000x magnification with a Nikon Coolscan 8000 ED camera and scan steps of 20µm) and were also analysed. A major aim during the practical course was to learn how to operate a TEM and how to obtain good quality images of biological structures. Next to the optimal technical microscope alignments, finding the right amount of focus is a crucial step towards decent results. With the help of Fast Fourier Transformations (FFT) of the recorded TMV images (Fig. 2 (A)-(D)) it was possible to calculate whether the in-focus position chosen by the TEM operator really coincides with the physically real in-focus position. This was achieved by measuring the distance (d0) from the centre of the image derived FFT transform to the first contrast shift of this transform (first black ring, so called Thon ring). In total 11 different focal positions were chosen ranging from -1700 nm defocus to +1700 nm overfocus (in 340 nm steps). Fig. 2 (A) and (D) display the two most diverging focus points, (B) is the defocus at which the most details are visible, and (C) is the in-focus position which was not part of the calculations. In the top left corner of every image the according FFT image is displayed. By dividing the square of d0 through the wavelength of the accelerated electrons (3.345×10-3 nm) the physically real focus position (Δf real) could be calculated. 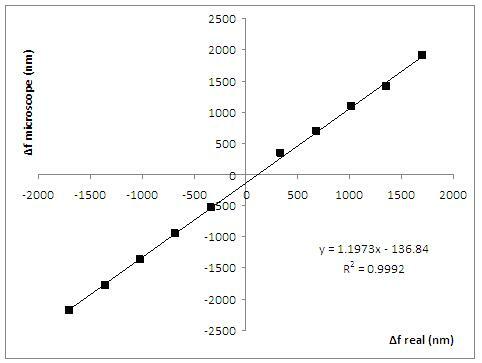 By plotting the calculated optimal focus values Δf real against the obtained values (Δf microscope) a straight line resulted which had its y-axis intercept at approximately -137 nm (Fig. 3). This indicates that the chosen in-focus position from Fig. 2 (C) was in fact 137 nm defocused. However, in order to achieve optimal resolution with optimal contrast a certain amount of defocus, which depends on the periodicity of the sample molecule, is necessary. In order to be able to determine this value the correct starting in-focus position therefore is crucial. Fig. 2: Results of a focal series with a TEM microscope imaging Tomato Mosaic Virus (TMV) including the Fast Fourier Transforms of the images in the top left corners. In total 11 images where taken in intervals of 340 nm. (A) displays the furthest defocus of -1700 nm, (B) has a defocus of -1020 nm and stripe patterns are clearly visible, (C) is in-focus (0 nm), and (D) is the furthest out of focus at +1700 nm. A 60K magnification was used to obtain the images. From the results in Fig. 2 it also becomes clear how to identify the right amount of focus without making use of the calculations which led to Fig. 3. A large defocus leads to a very grainy image which has a lot of contrast, but a relatively poor resolution. Large over focus, in turn, leads to poor contrast, but good resolution. The in-focus position is marked by a strong drop of contrast. All focus positions are accompanied by typical FFT image patterns. After having recorded high quality pictures, it was necessary to reduce the noise of the individual particles in order to be able to recognize details and separate similar but different particles from each other which might not be visible in the original dataset. Single-particle-analysis can be used to perform this task by averaging particles according to a previously defined reference consisting out of hand selected ideal particles. Averaged particles can then be split up into different classes which are defined by their bin size. During the analysis steps, the particles of the dataset are also centred and corrected for contrast differences and rotational position. For this course self-recorded worm haemoglobin (Fig. 4) and supplied Octopus vulgaris and Sepia officinalis haemocyanin molecules were analysed (Fig. 5). In the latter set it was possible to separate the molecules of the two species from each other. Fig. 3: Plot of the calculated focus positions (Δf real) against the chosen focus positions (Δf microscope) resulting in a straight line which indicates that the chosen focus position was in fact approximately -137 nm off from the real focus position. After the by-hand selection of a first reference set (not shown) the main Lumbricida haemoglobin containing files were aligned into nine different classes as shown in Fig. 4 (A). The classes are of varying qualities, but two molecular side- and eight top-views are distinguishable. By further improving the reference set and decreasing the class size (i.e. more and individually improved classes) it became possible to generate more different top- and side-views of the molecule (Fig. 4 (B) and (C)). Based on these classes the highest quality top- and side-view was selected. Fig. 4 (D) portrays these particles in which previously blurred structural details become visible. In addition single-particle-analysis can yield information which can lead to the separation of similar molecules and their spatial orientation from a mixture. As demonstrated by Fig. 5 the use of improving molecule references during particle analysis leads to a significant improvement of image quality. In Fig. 5 (A) the side-views are clearly distinguishable from the top-views, however, due to noise, it is not possible to separate the haemocyanin molecules of two species from this dataset. Improving the reference molecules more and more by aligning them to the cleaned dataset (reduction from 796 molecules to 754 molecules) yields strongly improved molecular details (Fig. 5 (B)). After classification and selection of the original dataset against this improved reference set clearly distinguishable haemocyanin molecules become visible. It can be hypothesized that the two molecules are representatives of the two present species, respectively. Fig. 4: Single-particle-analysis of Lumbricida haemoglobin. (A) Molecule classes based on a first hand-picked reference set. (B) and (C) Improved quality images by improving the reference and increasing the class size depicting top- and side-views of the molecules respectively. (D) Best quality views as selected form (B) and (C). Fig. 5: Single-particle analysis of Octopus vulgaris and Sepia officinalis haemocyanin molecules. (A) Non-analysed mix of haemocyanin molecules of both species. (B) Two distinguishable top-views and one side-view position arise from the dataset after single-particle analysis. During the course the focus lay on the practical application of TEM and the theory behind it in order to be able to record high-quality images and resolve simple problems which can be encountered during the procedures. Since information which is not recorded can not be seen later, it is crucial that all successive steps, starting with the sample preparation, are performed with great care and accuracy in order to yield good quality pictures which can then be analyzed. As demonstrated by Fig. 2 and Fig. 3 finding the right amount of under-focus depending on the molecular characteristics (patterns) is one of the most important steps. Balancing the needed contrast with an optimum resolution is the key to good results and requires practice. In addition by-hand selection of reference molecules from the dataset to which the whole dataset will be aligned is very important, since there is a strong selection bias. Experience with the observed molecules is an advantage because it enables the correct picking of all relevant rotations from the dataset and high accuracy classification afterwards. An experienced electron microscopist is therefore able to extract a significant amount of structural and therefore potential functional information from a sample of biological macromolecules. 1. Erni, R., Rossell, M. D., Kisielowski, C. & Dahmen, U. Atomic-Resolution Imaging with a Sub-50-pm Electron Probe. Phys. Rev. Lett. 102, 096101 (2009). Quantum dots (QDots) are a nice technique to label biological samples in a very non-invasive manner. This technique has emerged in molecular biology and biophysics during the last years since QDots offer a number of advantages such as large spectral range, high brightness, and high photostability when compared to regular fluorophores. Here, I want to talk about some of the fundamentals, possible applications, and examples of the usage of QDots. I am not a physicist, so you will not find too much of the theoretical background in this article. In order to understand the physical principal behind QDots, it is important to be familiar with the so-called electronic band structure of atoms. QDots are nanometer-sized crystals which consist out of semiconducting atoms such as silicon. 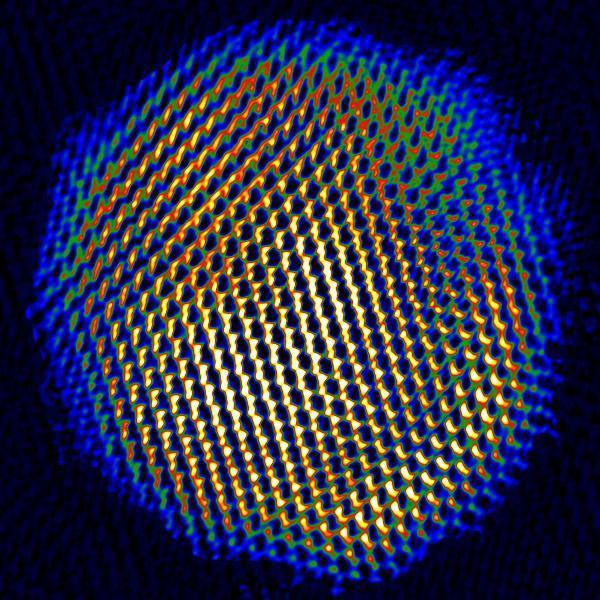 The electrons within these atoms can have quantified energy levels which are called bands. The highest and naturally most stable band is called valence band. However, the electrons within this band can be excited by for example photons that originate from a laser, and therefore reach a higher energy-state. In order to do so, the energy-barrier between the “old” and the “new” band must be overcome first. 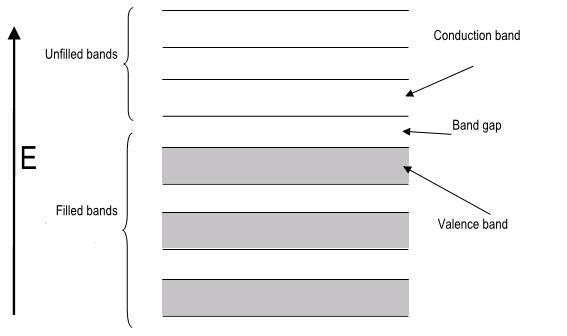 This barrier is called band gap (see also Fig. 1). Once the energy supply to the electron has been high enough it can “tunnel” the band gap and becomes conductive, meaning it can transform its energy to lower band electrons in other atoms. Now, current is flowing. Fig. 1: The principle behind and the build up of a QDot. Biological molecules (like antibodies) which are attached to the polymer coating of the QDot can be used to serve as a link between the QDot and a biological surface (1st picture: Wikipedia, 2nd: Jim Zuo / University of Illinois at Urbana-Champaign, 3rd: designed myself, originally from Invitrogen). However, there is an inverse relationship between this band gap and the size of the semiconducting crystal, i.e. the smaller the crystal, the bigger the band gap that has to be overcome. This results in the necessity to use higher energies to excite the QDot crystal in the case of a smaller crystal, which also leads to a stronger detectable photon signal when the excited electron falls back to its resting state. For biological applications an easily detectable signal is quite important, because it allows the studying of minimally labeled single molecules. Since photophysical properties of QDots strongly depend on their “custom-synthesized” structure, they are an ideal tool to stain biological samples. Still one obstacle remains: The required excitation energy for QDots is sometimes very close to the energy of the covalent bonds which link the individual semiconducting atoms with each other. This can lead to bond-breakage and freely diffusing atoms such as the toxic cadmium. Therefore, for the use in in vivo applications most QDots still need to be optimized. 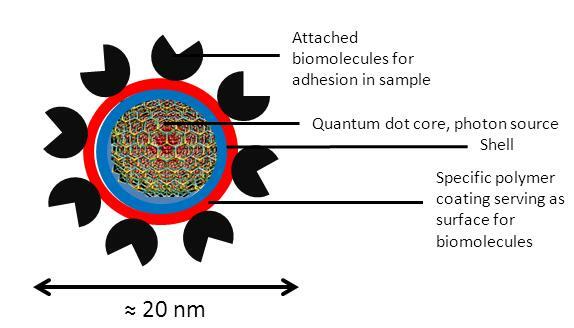 Nevertheless, QDots have demonstrated that they are an important tool for the biophysicist in in vitro experiments. One example is given below. In this example QDots are used to examine, whether the enzyme DNA helicase unwinds the DNA double strand (dsDNA) by sliding along the dsDNA or the leading single strand (ssDNA) during DNA replication. For this experiment the researchers added bulky molecules to one strand of the DNA which served as a “roadblock” for the DNA unwinding helicase. Here, this bulky molecule was a visible QDot. If helicase is attached to dsDNA to unwind it, therefore the enzyme will stop in any case since it will inevitably encounter one of the roadblocks. For the case that helicase only attaches to one strand of the DNA strands (the leading strand) in order to unwind the dsDNA, it will, of course, only stop if it encounters the bulky molecule on the leading strand, but not if this molecule is present on the lagging strand (which helicase presumably does not touch). To test this, the researchers used two different ways to visualize the situation. When DNA replicates it does so in two directions and therefore also two fork-like structures arise (Fig. 2 (A) middle). The bottom part of Fig. 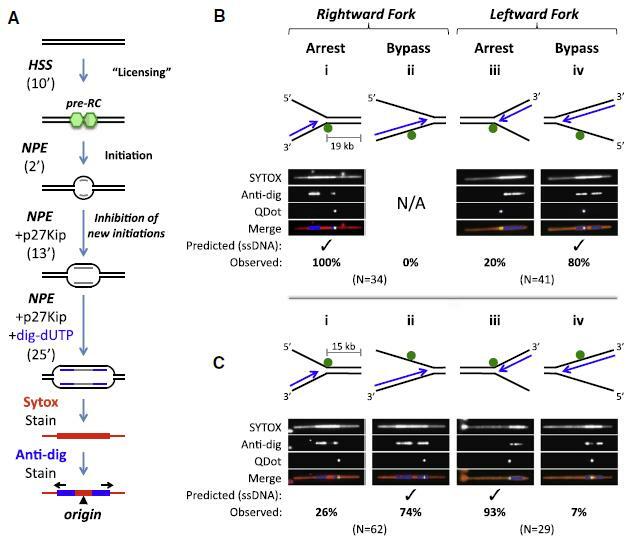 2 (A) shows how this fork-situation and the replication itself can be visualized by the addition of Sytox and dig-dUTP to an isolated DNA strain which is stretched by fluid flow. Sytox is a general DNA stain, so parts of the DNA that have already been replicated occur two times as bright as the non-replicated parts. dig-dUTP is added only during the last 25 minutes of the experiment. This means it is possible to observe into which direction the replication fork extends since this region will contain dig-dUTP and antibodies can bind to it. Fig. 2: Analysis of the helicase behaviour in the presence of a QDot roadblock on DNA. (A) Sytox staining was used to identify replicated DNA (2x stronger signal = thick red) and an antibody against dig-dUTP (blue marks) was applyed to picture directionality and potential blockade of the replication process. (B, C) Show the combination of the labels and their orientation towards each other (1). When concentrating on Fig. 2 (B) it becomes clear that helicase can probably only translocate along ssDNA. This becomes obvious when looking at the position of the QDot (the roadblock) and relating the staining signals towards it. In addition it is important top know that helicase can only migrate from the 3′ to 5′ direction. When the QDot is positioned at the “bottom” strand, double stranded DNA is only found left from it (red). Blue signal from dig-dUTP is only found left from red Sytox signal. Therefore, the strand is only replicated into the left direction and blocked to the right. However the helicase is able to bypass QDots which are not bound to its strand (Fig. 2 (B) iv). Compare also the fitting Sytox and dig-dUTP patters to it, which indicate that replication is also found after the QDot and into both directions. The QDot can, however, also be attached to the “top” DNA strand. This situation is analogous to the situation described above. Arresting and bypassing conditions are just inverted (Fig. 2 (C)). By making use of a visible roadblock, a.k.a. a QDot, it was possible to resolve a little puzzle piece of eukaryote DNA replication on single-molecule scale. The QDot gave the researchers some point of orientation in a complex biological process in which the identification of directionality is essential. (1) Fu et al. 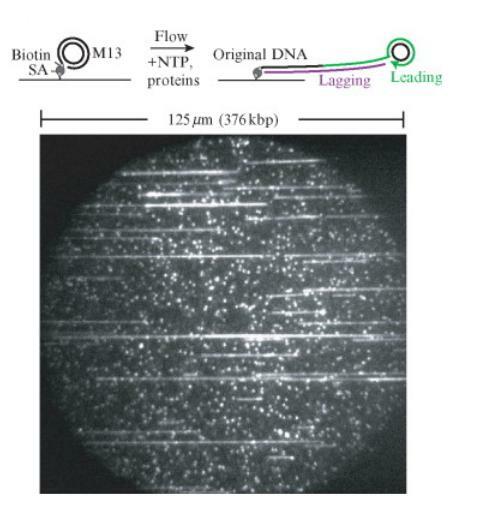 (2011), Selective Bypass of a Lagging Strand Roadblock by the Eukaryotic Replicative DNA Helicase, Cell 146, 931-941. Fluorescence cross-correlation spectroscopy (FCCS) is a powerful biophysical method to study protein-protein interactions with the help of fluorescent labels and a confocal microscope. During my work I found it a bit disappointing not to know some of the theory behind FCCS. Knowing how FCCS works and how to interpret the results is, however, essential for making sense out of the previous biochemical work. In essence FCCS measures the photons which are emitted from a fluorescent molecule after excitation through a laser which is attached to a biomolecule. Most of the time this is a protein. Another fluorescent label is attached to a second protein which is hypothesized to interact with the first one, but emits photons of a different wavelength than the first fluorophores. The confocal microscope only observes a femtoliter volume in which the concentration of the two proteins is in the nanomolar range. Proteins diffusing in and out of the focal volume are detected by detecting the emitted photons. Since big molecules diffuse slower than small ones, two different “fluorescence vs. time” curves result. If both proteins interact, one might observe a third curve which indicates even slower diffusion. However, in practice it is not so trivial to interpret the FCCS results. This is the approach of a master student to make some sense out of the matter and therefore not all translations from the mathematical formulas into English might be 100% correct. Comments on mistakes or misunderstandings are greatly appreciated! In order to study protein-protein interactions a dual-color setup (Fig. 1) is the method of choice, since differences in diffusion time for two molecules are hard to measure accurately if the molecular masses do not differ by factor four at least. To be able to excite the two different fluorophores two different excitation wavelengths are required. Two lasers fulfill this task. For a dual-color setup an additional normal mirror and an additional dicroic mirror are necessary. A dicroic mirror reflects light of one wavelength spectrum, but allows passage of another (Fig. 1). 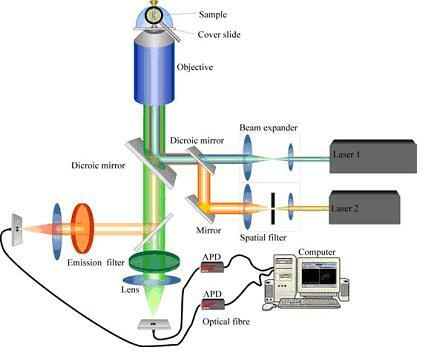 Via such a mirror therefore both laser beams can be focused on the sample volume (Fig. 2). After excitation the fluorophores emit photons of a higher wavelength due to photochemical energy losses. A second dicroic mirror allows only the passage of the desired emitted wavelength spectra. Since this spectrum contains the emission wavelengths of both fluorophores they need to be split by applying a third dicroic mirror which reflects the orange light in this examples and allows passage of the green light. Two emission filters that are located in the now separated light beams further “purify” the incoming light. Lenses now focus the light on a photoreceptor with one-photon sensitivity. Fig. 1: Functional parts of a confocal microscope suitable for FCCS while making use of a dual-color setup (1). Molecules now pass through the focal volume (Fig. 2). This leads to random photon noise which is depicted in Fig. 3. Sometimes signals arise that have a higher intensity (photons/time) than the noise which is always present. The strength of the statistical method behind FCCS is to extract meaning out of these fluctuations. By correlating the intensity fluctuations to the noise information about the molecule concentration (number of molecules) and molecular size (diffusion time) can be obtained. A brief overview about how this is done can be found below. Fig. 2: Molecules of different sizes pass through the focal volume (with circle) of the microscope and emit photons. The longer the diffusion takes, the more photons are emitted and detected (2). When molecules move through the focal volume they emit photons that are detected by for example a photomultiplier device (see above). The measured amount of photons is plotted against the time which yields an intensity curve that can be seen in the top left corner of Fig. 3. Since there are always photons detected that do not originate from the sample molecule, but are for example reflected there is a constant mean intensity measured, which is called noise. However, the signal also consists out of a fluctuating contribution which is significantly higher than the average signal. These fluctuations are the photons that are emitted by the protein linked fluorophores and therefore quite some informational value is linked to them. The two curves in the top portion of Fig. 2 essentially depict the same (photon amount per time), however the curves differ because different molecules are responsible for them. The left curve shows a small molecule which diffuses fast, the right curve a bigger and therefore slower molecule. When now the signal at one point in time (a fluctuation) is correlated to the average intensity over an increasing time period, a so-called auto-correlation curve results (Fig. 3, bottom curve). With the average measuring time being the same as the amount of time at which the fluctuating signal was measured the correlation is of course 1 (100%). However, when average intervals are increased the results resemble more and more the background noise and the measured fluctuation intensity at one point does not correlate with the average anymore or at least not perfectly (smaller than 1, bigger than 0). Plotting this number on a time log scale results in the autocorrelation curve shown below, which also depicts the decreasing correlation value between the measured signals as blue are between the curves. In order to detect nice fluctuations in the first place the concentration of the to-be measured molecule in the focal volume needs to be in the nanomolar range. Otherwise the fluctuations combine and become background noise themselves. Just on a higher level. The measured data, of course, in most cases does not perfectly overlay the theoretically determined curve which originates from the autocorrelation function. In order to achieve mathematical fitting is required. For FCCS a so-called nonlinear least square algorithm can be used which will not be explained here. The value that can be extracted from such a fitted curve is, that curves, when compared to each other, are differing. This is the result of different molecular properties like the concentration, the size (diffusion time) and triplet state. These features allow the characterization of the molecule. Fig. 3: Schematic overview of the origin of the actual autocorrelation curve from detected photon intensities plotted against time and correlated with average values of different time spans. For details see the text (modified overview with graphical elements from (1) and (3)). As already mentioned above, different molecular properties lead to (slightly) different curves. If, however the diffusion coefficients (size) of two molecules are very similar, also the resulting cross-correlation curves will be hardly distinguishable. Still, it is possible two examine the potential interaction of two molecules at the same time if both molecules are labeled with fluorophores that emit photons of different wavelengths. Fig. 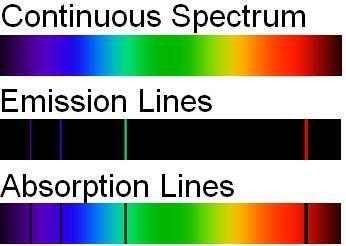 1 shows how these photons with different wavelengths are detected individually. Mathematically these slightly different curves (they, however, DO DIFFER in wavelength origin) can now be correlated with each other (cross-correlated) which yields information about potential dimer formation if the “new” combined curve cannot be correlated significantly to one of the previous ones. 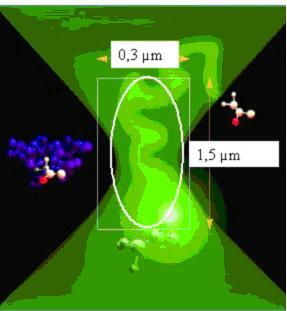 (1) Schwille & Haustein, Fluorescence Correlation Spectroscopy – An introduction to its concepts and applications, http://www.biophysics.org/Portals/1/PDFs/Education/schwille.pdf. (2) Jay Unruh, Fluorescence Correlation Spectroscopy, http://research.stowers institute.org/microscopy/external/Technology/FCS/index.htm.